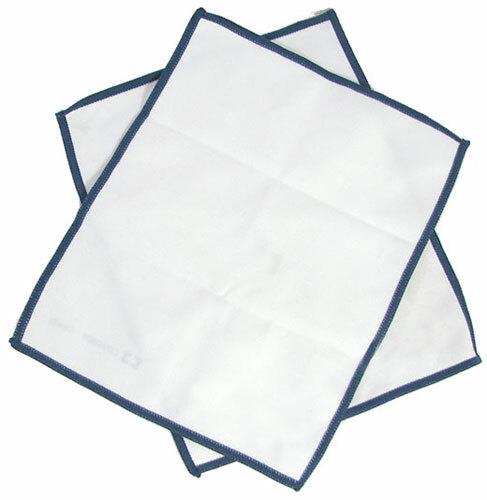 These white microfiber cloths are larger, at 6" x 7-1/2", and thicker than usual. Made for medical equipment (so you know the quality is excellent), they're dandy for eyeglasses, lenses, computer screens and other electronic equipment. White with a dark blue edge (with a small logo in one corner) they're actually attractive and could double as pocket squares. Bundled by the pair so you'll get (6) cloths in our Pkg(3), or try our super low 20-pair price. 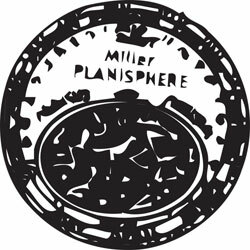 Whether you're a beginner or an experienced stargazer, with or without a telescope, you'll get more out of the night sky with a Miller Planisphere. 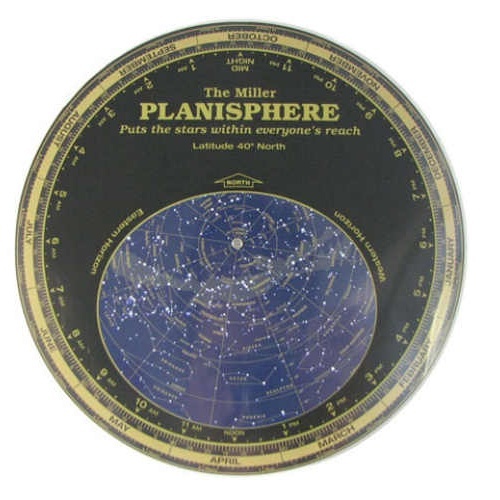 This 10" rotating double disc is a map of the planets, stars and constellations, useful across a large range of the northern latitudes, although most accurate in the range of 35° to 45° north. It can be aligned to the time and date in your location to display a detailed map, and includes tips on finding the planets, suggestions for telescope projects, and more. It's an invaluable learning tool that makes stargazing a lot more fun. 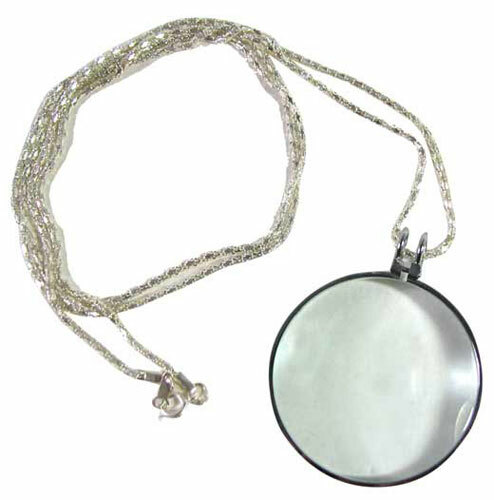 Excellent quality 1-3/4" dia magnifier on a gold- or silver-colored, thin 36" chain with clasp. 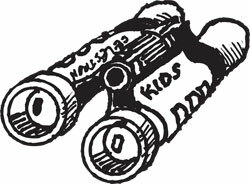 Package calls it 5X but our magnification guru says less than that at optimum focal length. Perfect for wearing to formal antique shows. Polished glass equilateral prisms. Equilateral because each edge of the end is the same length, 32mm. Thus, as all you geometry students know, each of the angles is also the same, 60 degrees. These are school grade and are fine for decorative and demonstration. They do a nice job of refracting light to produce a nice rainbow-like spectrum, but are definitely not up to instrumentation standards. 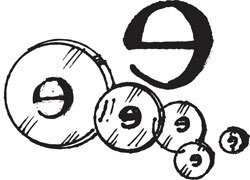 The missing dimension, length, is shown below. 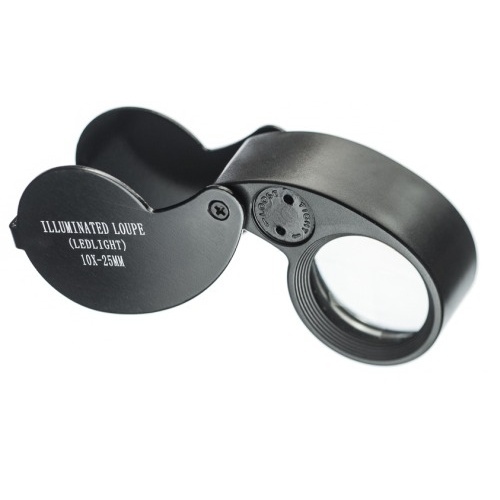 This 10X folding loupe in black plastic and aluminum has a pair of very bright white LEDs next to the 25mm lens. 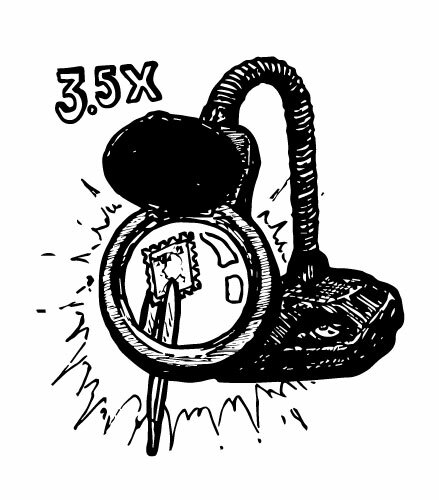 Runs on (3) button-cell batteries, included, and has a tiny wrench to help you replace them. Loupe and wrench stow snuggly in a foam lined plastic case. When folded, it looks like a standard coach's whistle, or a really big apostrophe. Work like a watchmaker with this extremely steampunkish clip-on triple loupe. 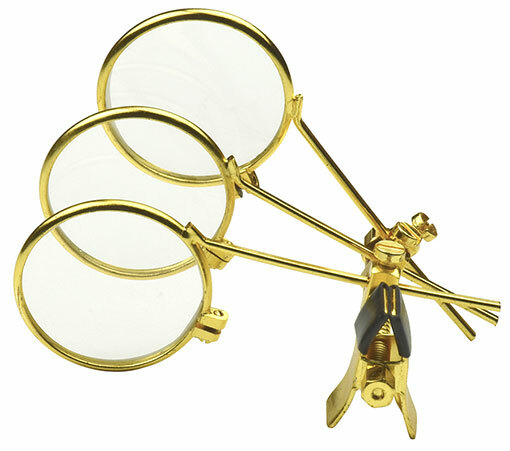 In brass-plated steel, it clips on the temple of a pair of glasses with the three 15/16” dia lenses (2X, 2.5X and 3X) on 1-1/2” long arms that swing in and out and are adjustable via set screws. The spring clip for the glasses opens to 5/16”. 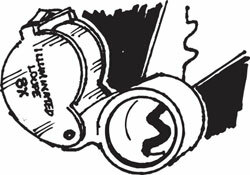 Working distance is short like all loupes, but you’ll look extremely cool. 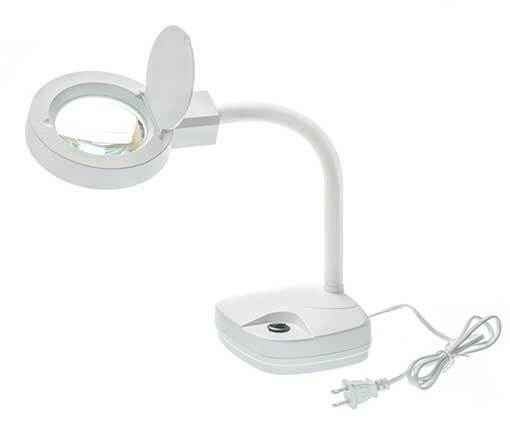 This monster magnifier on a gooseneck stand doubles as a reading lamp. The 3-1/2” dia, 3.5X magnifying glass is surrounded by a bright 12W 1200 lumen LED ring of lights, all on a 12” gooseneck rising from a 6-1/4” x 5-1/4” x 1-1/2” thick base with a 4-foot power cord. 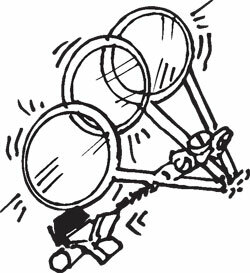 The magnifying lens has a flip-down cover, which converts it to a reading lamp. Comes in mysterious black and inquisitive white; we'll choose the one that's best for your feng shui. The kids need presents for all the grandmas and great-aunts? You volunteer at the nursing home and need token gifts for your L-O-Ls? And your eyes aren't so good, either? Our each is really half a dozen pretty little magnifiers with round, glass lenses and fancy handles. The handles are silver-bright (hard to believe they're aluminum) and all different. Each has a discreet hole in the tip for a jump ring so it could be worn on a necklace -- but it would look just as pretty on a desk. 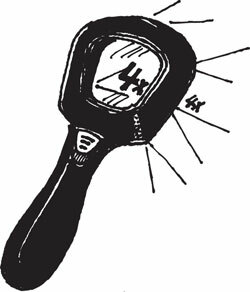 The overall length of the (6) magnifiers varies from about 3-3/4" to 5", the lenses from 1-1/4" to 1-3/4" dia. All are approx 2X magnification. Mary Ann's pick of the month. Need An Extra Hand With That? How about three extra hands? 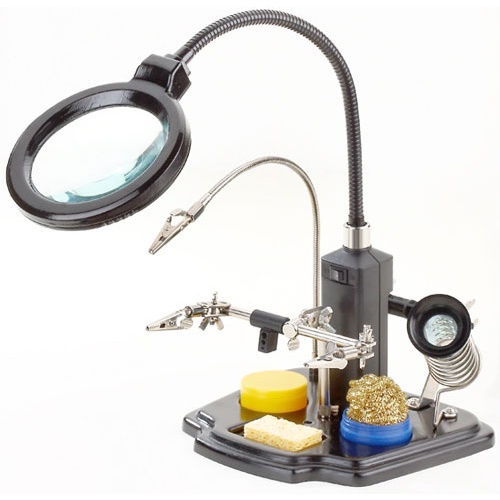 This multi-purpose workstation tool has a large 3X, 3-1/2" dia LED-lighted magnifier on a 10" gooseneck (you add 4 "AA" batteries), a soldering-iron stand, cleaning sponge plus steel wool, a canister of flux paste, a pair of alligator clips with ball-socket mounts on the ends of a 4" rod plus an extra hand with a third alligator clip on a 10" gooseneck. It all weighs in at a stable 3+ lbs and has a 7-1/4" x 6-3/4" base so you won't need fourth hand to hold it upright. 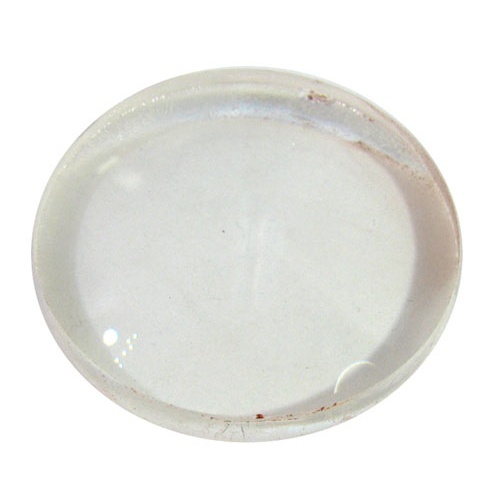 Thick, but very desirable, like a nice fat slice of salami, these negative meniscus glass lenses are 55mm dia with a focal length of -169mm (think: reduction). Great for artists and crafters. Edges might have some slight chips, but that's surplus for you. 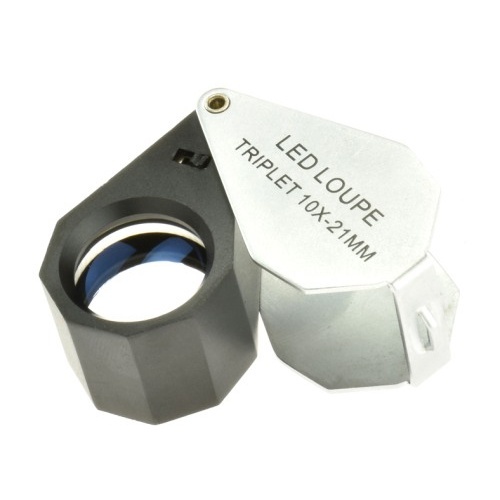 Our best jeweler's loupe, this has a professional-quality, full 10X triplet lens. 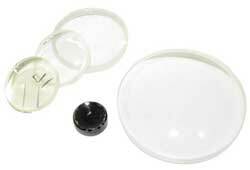 A ring of (6) white LEDs around the 13/16" glass lens ensures an even distribution of light. 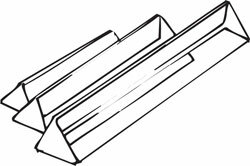 Housing is an angular, 7-sided teardrop shape 1-3/4" x 1-1/8" that folds out of a metal case with a strap hook. Tucked into the small leather pouch it comes in is a spanner wrench, in case you ever need to replace the (3) button-cell batteries. Well, okay, glass, because rubber is hard to see through, but the handle and frame are covered in black rubber. 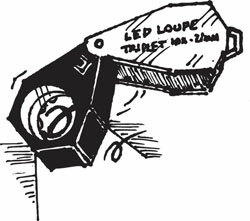 Approx 2" square lens magnifies to 4X. Has a 4-3/4" handle and a frame with (5) white LEDs and (1) UV LED on the business side, the better to see that tiny print, or to check out money, stamps, insects, etc. Uses (4) included AG10 button-cell batteries. The sport of the future? 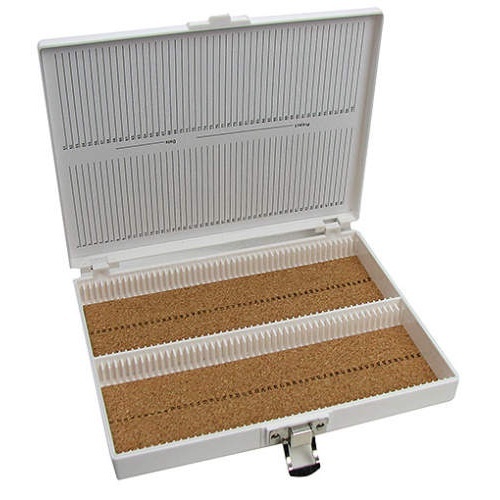 No, cork-lined polystyrene boxes for holding microscope slides, complete with numbered slots and inventory sheets on the lids. 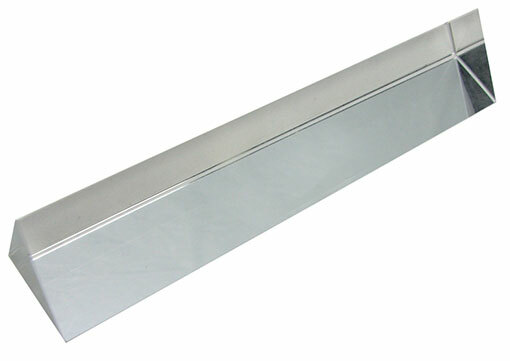 The boxes are 8-3/4" x 6-3/4" x 1-1/3" with hinged lids. They are stackable, and you might get them in a variety of colors. Treat yourself to an assortment of our finest negative meniscus lenses in sizes between 14mm and 52mm with focus lengths between -29.7mm and -169mm. 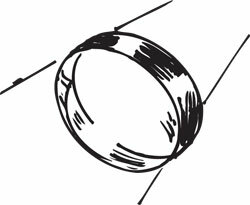 Negative meniscus lenses spread light instead of concentrating it, so they're sort of de-magnifying glasses. (Perfect for reading if your vision is too good.) You get (4) lenses in each of (5) sizes for (20) total. 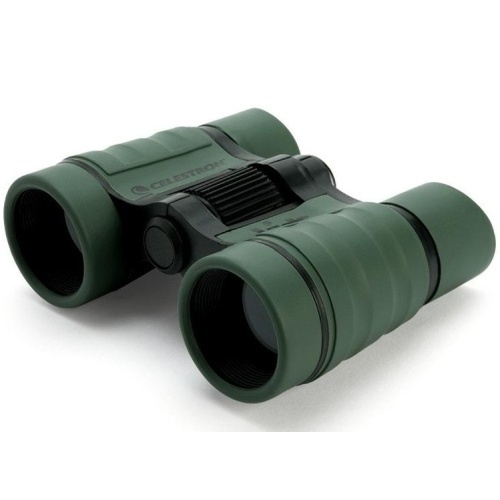 This green, rubber-coated 4X binocular from Celestron® is kid-sized but otherwise very high quality with coated lenses, an 18" neck cord, belt-mount carrying pouch and lens cloth. Has 30mm objective lens diameter and a 4.3 degree X 225-foot field of view at 1,000 yards. 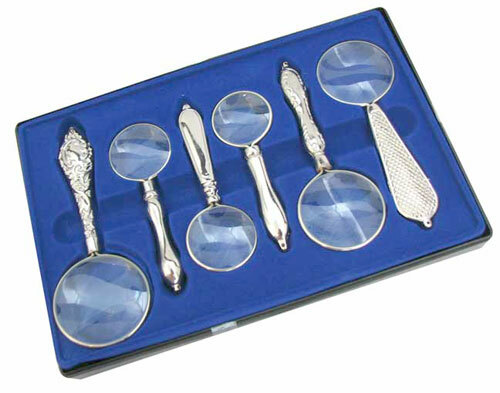 Microscope glassware for examination of blood, pond water, mold, and other minutiae. 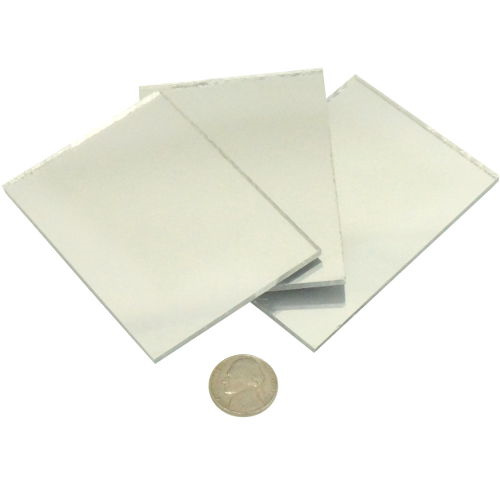 All of the microscope slides are optically clear glass 26mm x 76mm (about 1" x 3"), between 1mm and 1.2mm thick. 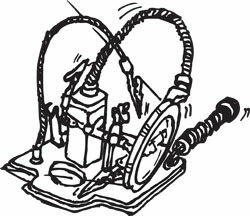 The well slides, of course, have a concave well to hold a drop of liquid. 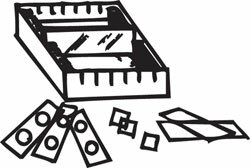 Our each is a package of (12) well slides, or a box of (72) standard slides with ground or beveled edges. 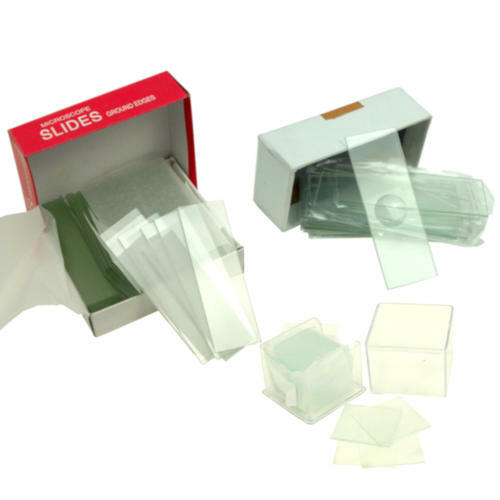 Cover glasses are the smaller and very thin pieces of glass used as the top of the glass slide sandwich. They are often used temporarily by simply dropping them onto a drop of liquid to flatten and spread it and to minimize evaporation. 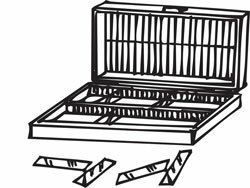 More confident microscopists will cement them in place to permanently preserve a specimen. Our each is a package of (100) cover glasses 18 mm square, #1 thickness (0.13mm to 0.17mm). If you need one, you need both. 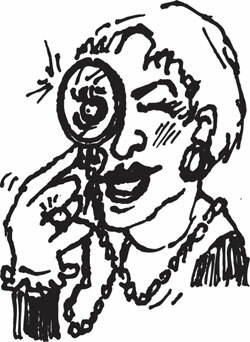 When you peer through your magnifying glass at this specimen, or focus your microscope on it, even at the lower magnifications which work best, you're looking at one big bug. Make that (4) big bugs. 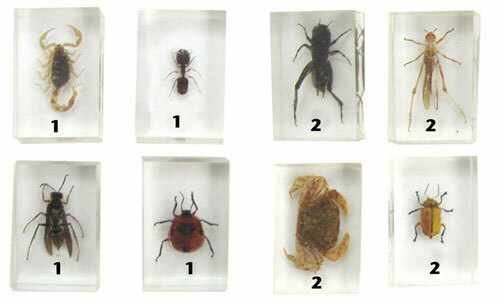 The insects are real, encased in clear acrylic blocks 1-3/4" x 1-1/4" x up to 11/16" thick, and ready for inspection. Set 1 includes a scorpion, giant ant, wasp and a flower bug. 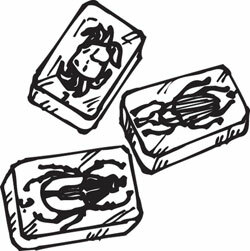 Set 2 is a cricket, locust, yellow leaf beetle, and crab. No, not a crab louse or a crab spider, but definitely a crab ugly.